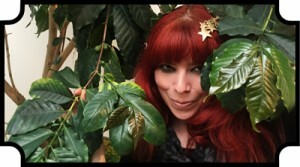 Starbucks is testing the facebook @ work platform, and I am in the pilot for it. It is essentially, facebook, but only for Starbucks partners, and you can only access it by logging in with your global username and password. It is actually a very cool way to interact with partners all over the globe! I joined the coffee tastings group (naturally), and there were a few partners challenging each other to use fruit as a vessel. Kenya in grapefruits, Colombia Las Margaritas inside a pear, Willow blend in a lemon, it kind of turned into a coffee tasting throwdown. I decided to join the fun and serve up the real pumpkin spice latte. While I was in Sacramento, I stopped at Teavana and stocked up on their seasonal teas. 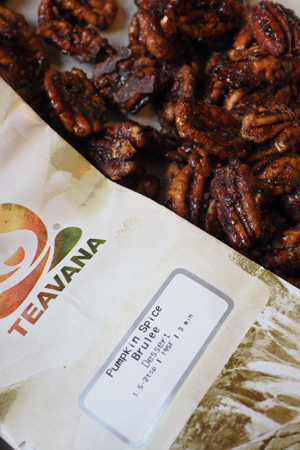 (We do not have a Teavana store nearby, sadly). So many of my friends love pumpkin spice lattes at Starbucks, and I thought they might appreciate the pumpkin spice brûlée tea from Teavana. 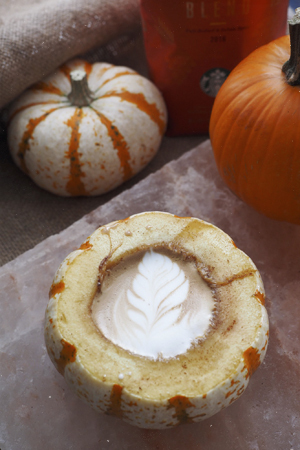 It’s the perfect mix of pumpkin, cocoa, caramel, vanilla and ginger. When I came up with this recipe, I wasn’t planning on blogging about it, but I did post it on facebook, as I was tossing ingredients in the pan. My friend Melody, tried it, loved it and blogged about it! The response was overwhelmingly positive, so I thought I would add it here as well. There is a small window, right before the Christmas mania begins, where Starbucks Thanksgiving blend appears in stores. Thanksgiving blend was created in partnership with Seattle restauranteur Tom Douglas in 2008. The goal was to create a blend that could pair with both sweet and savory foods, a culinary coffee to compliment a Thanksgiving feast. Ten blends were created, but Tom and master blender, Anthony Carrol, narrowed it down to two. Tom cooked a Thanksgiving feast, and paired the two coffees with the meal. 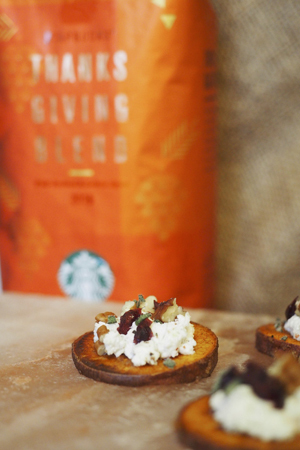 When paired with the herbed stuffing, one coffee stood out. Thanksgiving Blend has become a tradition is many homes over the past 8 years. It is a blend of coffees from Sumatra and Guatemala, spicy and full bodied with subtle herbal notes. Coffee grown in high altitude tends to mature slowly, developing more character, depth of flavor and a higher sugar concentration. This improves the flavor profile of the coffee bean.